L'Dolcevita OÜ is an Estonian retail company, which has been operating Change Lingerie, Okaidi and Bottega Verde stores for over 10 years. The mission of the company is to provide the best purchasing experience in the Baltics with excellent customer service, wide product range, and an enjoyable store environment. Change is a fashion brand of lingerie, nightwear, and accessories, which is represented in three cities in Estonia. 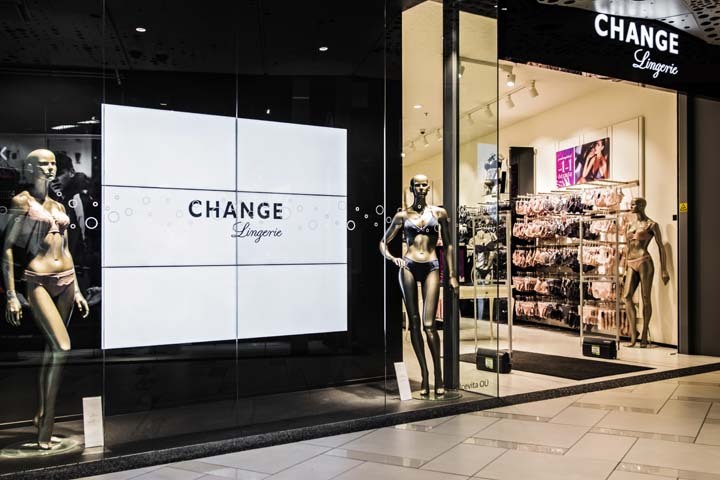 In the summer of 2018, the Change Lingerie store in Ülemiste shopping center was renovated and existing posters on the display window were replaced by an eye-catching video wall. Hansab installed a video wall, which is made up of 6 Samsung 46’ displays. Featuring an ultra-narrow 3.5mm bezel-to-bezel design format, which is the slimmest bezel in the video wall industry. This display is able to create a virtually uninterrupted viewing experience to keep audiences focused on content rather than the display itself. Managing the screens and adding content is done remotely via Navori QL MANAGER Content Management Software. This software enables schedule the content, create calendars and playlists. Navori Advertising feature allows specifying how often specific content should be played in a predetermined time frame. This is a good way to provide an opportunity to show ads for the third parties.